At eighty-two, Florida Scott-Maxwell felt impelled to write about her strong reactions to being old, and to the time in which we live. Until almost the end this document was not intended for anyone to see, but the author finally decided that she wanted her thoughts and feelings to reach others. Mrs. Scott-Maxwell writes: "I was astonished to find how intensely one lives in one's eighties. The last years seemed a culmination and by concentrating on them one became more truly oneself. Though old, I felt full of potential life. It pulsed in me even as I was conscious of shrinking into a final form which it was my task and stimulus to complete." The territory of the old is not Scott-Maxwell's only concern. 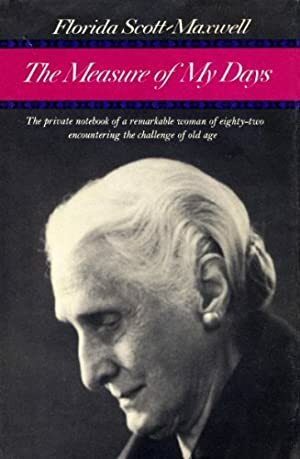 In taking the measure of the sum of her days as a woman of the twentieth century, she confronts some of the most disturbing conflicts of human nature -- the need for differentiation as against equality, the recognition of the evil forces in our nature -- and her insights are challenging and illuminating. The vision that emerges from her accumulated experience of life makes this a remarkable document that speaks to all ages. Track It. This book has been £4.84 within the past year. Log In to track Florida Scott-Maxwell on eReaderIQ. to be notified each time the price drops on any book by Florida Scott-Maxwell. to stop tracking Florida Scott-Maxwell. We started tracking this book on April 18, 2014. This book was £6.11 when we started tracking it. The price of this book has changed 98 times in the past 1,826 days. The current price of this book is £10.99 last checked 9 hours ago. This lowest price this book has been offered at in the past 90 days is £9.99. This lowest price this book has been offered at in the past six months is £8.99. This lowest price this book has been offered at in the past year is £4.84. The lowest price to date was £3.65 last reached on May 10, 2014. This book has been £3.65 one time since we started tracking it. The highest price to date was £13.99 last reached on January 13, 2019. This book has been £13.99 2 times since we started tracking it. We last verified the price of this book about 9 hours ago. At that time, the price was £10.99. This price is subject to change. The price displayed on the Amazon.co.uk website at the time of purchase is the price you will pay for this book. Please confirm the price before making any purchases.